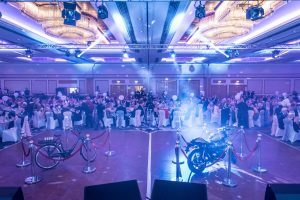 Saturday 24th November was a very special evening in the Get A-Head calendar; it was the evening of our 25th Anniversary Ball and we raised a fantastic £65,000 on the night. Over 400 guests arrived looking glamorous and handsome in their evening dress and were welcomed to the Hilton Birmingham Metropole, with a drinks reception supplied by Paul Roberts Wines Ltd.
After welcome drinks, guests were shown through to the spectacular Monarch Suite, dressed in all its glory, with beautifully laid out tables, silver and pink covered chairs and gorgeous centre pieces supplied by Covered in Love of Solihull and a back drop with a sparkly mirror balls superbly organised by Lemon Zest Events. A short film was played that showed our highlights of the past 25 years, from over £6m raised to over £1.5m spent on research, from 10,000 Ball Attendees to 5789 volunteer hours, from 61 skydivers to 6 kayakers – you can see the best bits here. 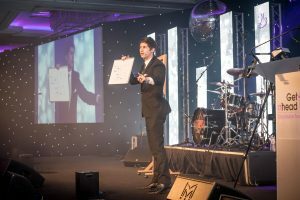 The evening was jam-packed full of entertainment, and was expertly compered again by the wonderful Ben Hanlin, who also captivated the crowd with his magic tricks. 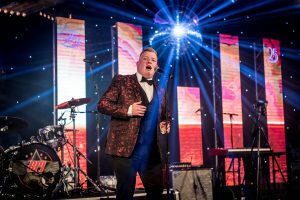 During dinner we were entertained and captivated by the wonderful singing sensation, Gruffyd Wynn, the talented Classical cross over artist who hails from the Isle of Anglesey and was a finalist in Britain’s Got Talent 2018, who received a well-deserved standing ovation. 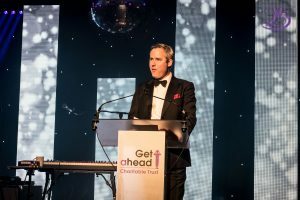 Tom Bromwich, Chairman of Get A-Head, thanked all who had attended and all those that played a part in the evening during his speech.. He said “in the VT you saw, John promised he would not let anyone down that saw him as a patient – I also promise that as a Charity we will not let you down”, he went on to say “the move to Solihull has been fantastic and we are now fully integrated with the local community and our presence is going from strength to strength” and in closing Tom said ” It is a fantastic achievement that we have reached 25 years but we have much to do and I look forward to helping to grow the Charity over the coming years”. Dr Hilary hosted our very own ‘This Is Your Life with Get A-Head’ for John Watkinson, who co-founded the Charity back in 1994. It paid tribute to our co-founder, John, with video messages from friends, patients and family. This then led us into our main auction, fantastically undertaken by James Hawkesford of Hawkesford Auctioneers with tickets to see Cher perform in New York and the opportunity to meet the lady herself, kindly donated by Cher, followed by many other excellent and exceptional prizes, including Triumph Street Cup Motorbike donated by Triumph Motorcycles and a Urban City e-bike donated by Paul Staniforth of Electric Bike Corporation, and a whole host of other fabulous prizes. We also had lots more fundraising going on during the evening in the forms of Play Your Cards Right, a Raffle, Silent Auction all with fantastic prizes and a Special Silver Envelope Draw with a £1,000 John Lewis Voucher up for grabs. Jon Culshaw, the award-winning impressionist was our headliner and entertained our guests with his vast array of voices. 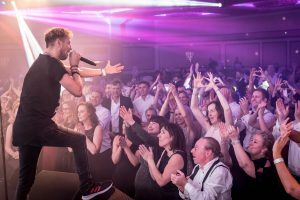 After the fundraising and auctions, the evening ended on a real high note with live music and an electrifying performance from the Rick Parfitt Junior band, the dance floor certainly got put through its paces as the crowd were pulling out all the moves and enjoying the electric atmosphere! 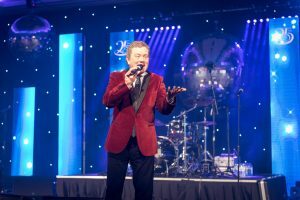 “Our host Ben Hanlin was superb, Gruff’s set was perfect, Jon Culshaw impressed with his many impressions, the main auction raised a whopping £40,000 and the return of RPJ had our guests just a tad excited. 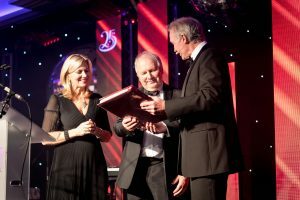 “The highlight for me was Co-Founder, John Watkinson receiving a special This Is Your Life tribute for his 25 years with Get A-Head, very well deserved, you could have heard a pin drop while this took place, which showed huge respect for John.